In that long-lost age prior to CGI, movie producers had three means of bringing “live-action” dinosaurs to the screen. There was the man-in-rubber-suit method popularized by Godzilla and kin. Then there was stop-motion animation as employed by Willis O’Brien and Ray Harryhausen. But if you didn’t want to spend months meticulously photographing articulated models, and you hated the smell of latex, there was one tried-and-true recourse: actual reptiles. 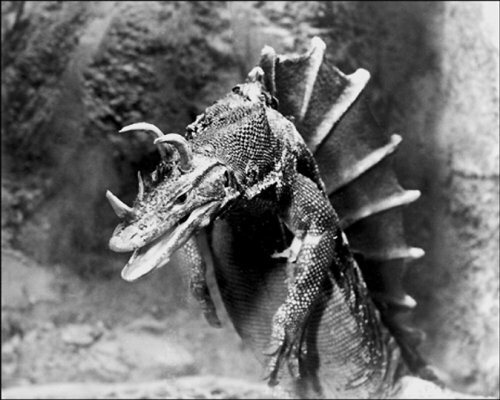 An ambitious effects artist might glue some weird horns or frills to a monitor lizard to make it look more dinosaurish (emphasis on the -ish), but at least one unmodified iguana showed up in the 1940 D.W. Griffith-produced One Million B.C. 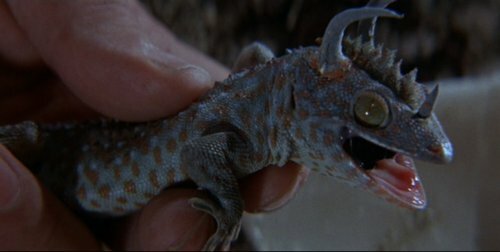 The funny thing was that, despite growing up a dyed-in-the-mammoth-fur dino nut, I never minded the lizards very much. If I squinted my eyes real tight, I could just about imagine the photographically-enlarged caimans to be honest-to-goodness prehistoric monsters. Nope, sorry, not buying it. …is not a baby T. Rex. I don’t know what the hell this is. But it’s not a Brontosaurus.